An unhappy mother has questioned the services provided by Samoa Post after a passport she sent to China disappeared. Naomi Tavila, a teacher by profession, said she is tired of waiting and the excuses and hence her decision to speak out to alert other members of the public. Mrs. Tavila said her son, who is in China for a scholarship, needed a new passport to extend his visa, which expires this month. But the parcel she sent containing the passport has not arrived and worst still, nobody seems to know where it is. “I went to the Post Office in June to send a package which had my son’s passport,” she said. “They (Post Office) told me that they will send it through the registered mail. “I asked them how long will it take for the package to arrive in China and they told me it usually takes three weeks. “So I called up my son and told him about it and to check after three weeks if he had received his passport. I told him to check with the Office of the Ambassador because that’s the destination of the package I sent. “This was in June. Then my son called me and said that he wanted to come over in August for his friend’s wedding, but he needed his new passport so he can travel to Samoa. “So he came using his old passport which will expire in November. But he needed a new passport because he is supposed to stay there for another year. “And so we kept checking with the Post office but they told us that the package still hasn’t reached China. Mrs. Tavila said when her son got back to China in August; the Chinese Immigration told him that if he doesn’t get his passport to extend his visa for school, they would send him back to Samoa. “So he went to the Samoan Ambassador in China and explained what happened. So the Ambassador made a request to the Chinese Immigration Office and they gave him 15 days to get his new passport. “My son called me again and asked me that he really needed a new passport. “So I went back to the Immigration office here and made a new passport because the post office didn’t give us any update on the package that I sent to China. “And that cost me $450 to do another passport because my son really needed a new passport. “I went back to the Post Office and asked them again for an update, and that was after I have been going there five times. But they showed me the paper which showed that the package was stamped in Australia. But after that, they couldn’t track it anymore. “I also asked them if there was a possibility that they can get the package again if that was the case, but they said there was a possibility, but it will take some time until they get it back. “I was disappointed because they kept telling me to come back to check for an update, but there was nothing. I spent a lot of money going back and forth and having to do another passport because they failed to send the first one to China. Mrs. Tavila said she then asked the post office for a letter to the Immigration office to cancel the passport that was issued in June because there is no luck of getting it back. “So I asked them to write a letter to confirm that the package hasn’t been received and that they couldn’t track it anymore. “Because I wanted to cancel the passport that I sent already, because I have already made a new one and I didn’t want anyone to use my son’s passport in an illegal way. So they wrote a letter to the immigration, and that they’ve cancelled the passport that was issued in June. Mrs. Tavila has turned to the media so that the public would be aware that it’s no longer safe to send packages through registered mail. “I also warned them that I will then turn to the media to voice my disappointment. Because I am not so sure if we can trust their service anymore. It’s not safe anymore. Because we don’t know if there were any other packages being sent together with my parcel. So it seems like all those are all lost as well. “As for the second passport, I decided not to send my son’s passport through mail, but instead, I was then looking for someone who was travelling to China so the passport can be hand carried to China. Because I didn’t want to wait again and end up having it lost somewhere else. “So I asked someone else to carry it because the 15 days the Chinese Immigration gave to my son was almost over. I know they will not be able to get it back. But I asked them to pay back the money that I spent on making another passport. “The reason why I turned to the media is so that the public would be aware that it is not safe to send mails or packages through the registered mail. Mrs. Tavila said she had been going to the Post office a lot to follow up and check the package. 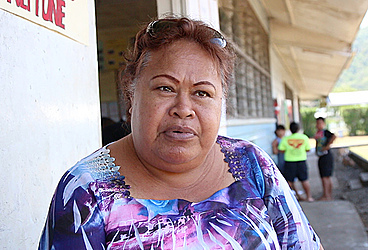 The Chief Executive Officer of the Post Office, Tupe Ualolo Nun Yun was contacted for a comment last week, and she said she wasn’t aware of Mrs. Tavila’s case. When the Samoa Observer called back yesterday, an official there said she was on leave.